Manifesto: a new idea with prescriptive notions for carrying out change. Manifesto 2 – Cult of Done. A core part of my personal brand is embracing the concept of 80-20. You can get 80% of the way there with 20% of the total effort. This is (usually) enough. Conversely, to get towards “100” takes immense effort – time, money, focus. Especially in times of increasing change and cognitive dissonance. 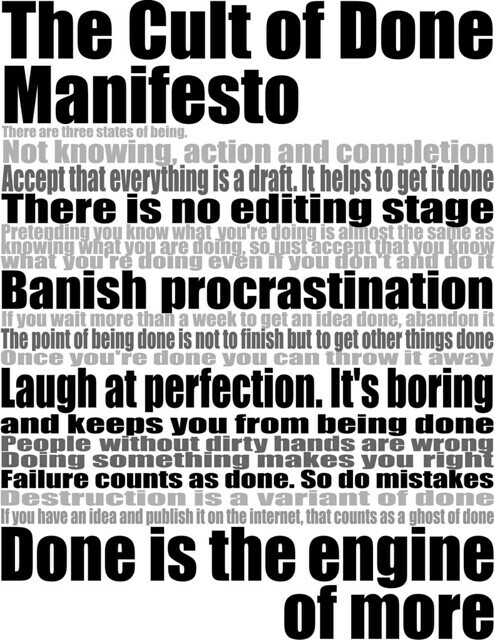 Therefore, I get the Cult of Done Manifesto. It dovetails well with the TMWK commitment to Be F.R.E.S.H.